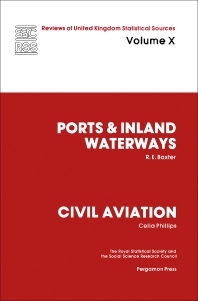 Ports and Inland Waterways is a review of sources of statistics on ports and inland waterways in the United Kingdom and covers subjects such as foreign traffic by commodity; coastwise traffic by commodity; special traffic; scheme and non-scheme port traffic; container and roll-on traffic; contents of containers; driver accompanied and unaccompanied road goods vehicles; and restow movements. Transhipment and transit movements are also included, along with fishery traffic, passenger traffic, and shipping movements. This volume is comprised of 12 chapters and begins with an overview of ports and shipping places in the United Kingdom, with emphasis on standardization, collection, and collation of port statistics on a national basis and the creation of the National Ports Council under the Harbours Act of 1964. A brief summary of industry activity concerned and its organization is given in order to present a clear background understanding of how data are collected; what is being measured; the stage at which measurements are made; what the reporting units are; the channels through which returns are routed; and where they are processed. Statistics of customs ports and other areas of the industry are then provided, including those of manpower and finance. Proposed developments for the industry are discussed in the last chapter. This book will be of interest to transportation officials, statisticians, economists, and social science researchers.